In the spring of 1867, Richmond was a city filled with tension and a fight between African Americans and city policemen, who were described as former Confederates, broke out on the afternoon of May 11. United States Army troops dispersed the crowds, which is the scene depicted in this engraving. Federal judge John C. Underwood and Horace Greeley urged calm in their remarks at First African Baptist Church the following day. 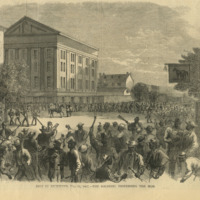 “Riot in Richmond, May 11, 1867—The Soldiers Dispersing the Mob,” Remaking Virginia: Transformation Through Emancipation, accessed April 26, 2019, http://www.virginiamemory.com/online-exhibitions/items/show/621.